This database includes names indexed from two groups of records: general applications and orders for removal of restriction, and petitions for removal specifically to use the land as a townsite. This index was created from the applications made by individuals to remove restrictions from their allotted lands found in the Indian Archives Collection. The collection also includes orders for restriction to be removed. The documents include first and last name, roll number (in most cases), tribal affiliation, and in a few cases blood quantum is listed. The index includes more than 11,000 names. These materials are part of the Union Agency Records and they pertain to the Five Tribes: Cherokee, Chickasaw, Choctaw (including Mississippi Choctaw), Muscogee (Creek), and Seminole. Most of the information contained in the document has been included in this database. Below are examples of the application and order documents. The townsite records contain petitions from individuals for the removal of restriction on land for townsite purposes. Included in the files are questionnaires, plat maps, and correspondence. Most files include legal land descriptions. To search these records, enter the name of an individual. The files are organized by town within the tribal nations. There are only a few files per town and not all towns are represented. The files date from 1903 to 1909 and can be found in the Indian Archives Collection, Dawes Commission Records. This database includes 467 names of individuals in Cherokee, Chickasaw, Choctaw, and Muscogee (Creek) Nations. During the land allotment period in Indian Territory, Congress made the decision to restrict allotments of American Indians who enrolled with one-half or more blood quantum. Members of Congress believed that the restricted tribal members did not fully understand what it meant to own land as a private owner, since their cultural practice prior to allotment was to share the land with other tribal members. Congress also believed that tribal members with one-half or more blood quantum could easily become persuaded by white citizens to alienate (or give up) their own property, which might mean they would lose their allotment in its entirety. According to Section 19 of the Act of April 26, 1906, the decision made by Congress states: “That no full blood Indian…shall have power to alienate, sell, dispose of, or encumber in any manner any of the lands allotted to him for a period of 25 years…” This meant that restricted tribal members were not in control of their own property and had a guardian assigned to them who would make decisions about the allotment. On May 27, 1908, legislation known as the Restrictions Bill was passed. This law removed restrictions on all lands and homesteads of intermarried whites, freedmen, and those enrolled with less than one-half blood quantum. For individuals with a blood quantum between one-half and three-quarters, restrictions remained on homesteads, but were removed from all other lands. For full-blood individuals and those with more than three-quarters blood quantum, all lands and homesteads remained under restriction. 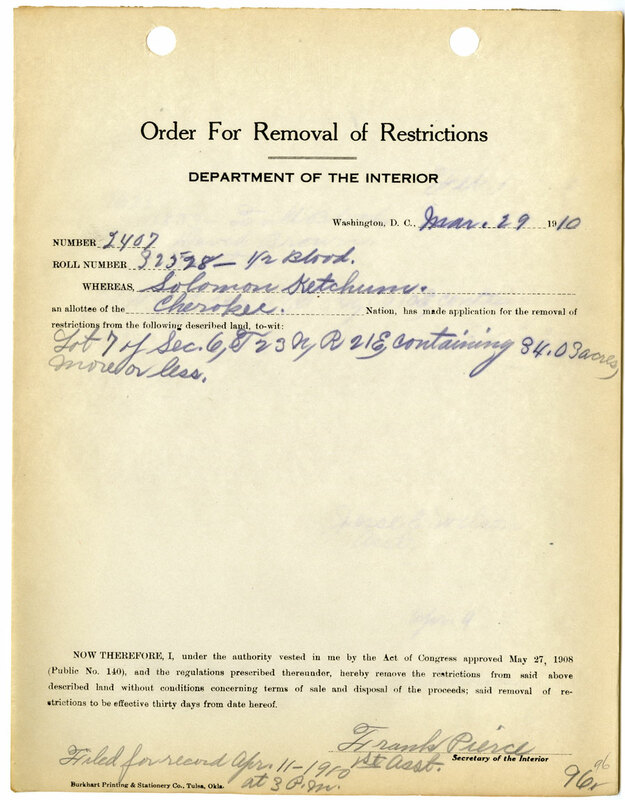 The Restrictions Bill also confirmed the authority of the secretary of the Interior to remove restrictions. Restricted tribal members could make an application to a US Indian agent for the removal of their restrictions. The field Indian agent would then investigate the applicants and forward any reports and recommendations to the Department of the Interior, which would be reviewed by the secretary of the Interior. The secretary had the final say as to whether restrictions should be removed or not. Once restrictions were removed, they could not be reimposed. Section 9 of the Act of April 10, 1926, explains in the instance an allotment recipient died, the restriction would essentially “die” with the original allottee, allowing the heir or heirs to gain control of their share of the allotted land. Visit the Research Center to view these records from the Indian Archives Collection. 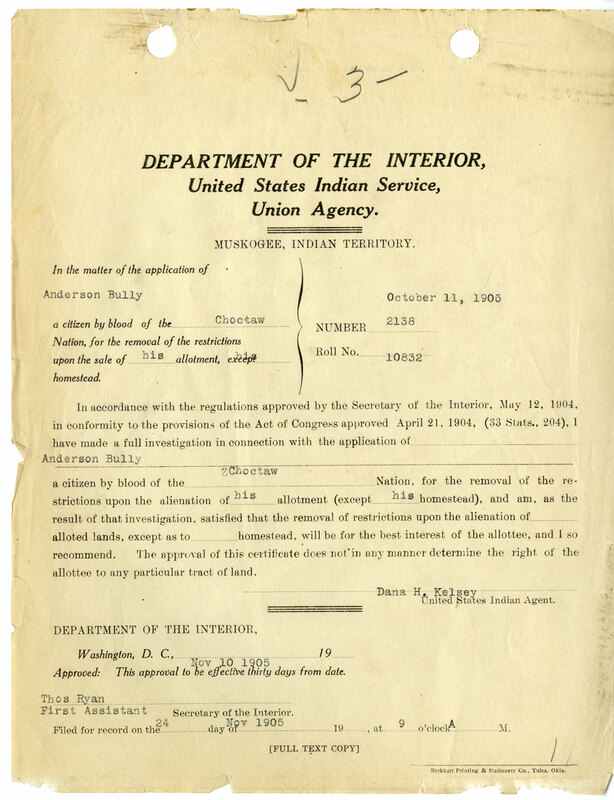 Removal of restriction applications and orders are part of the Union Agency records; townsite documents are part of the Dawes Commission records. The Research Center offers a $15 express service for orders from this database. Please note that this database includes most of the information listed on the records. To order copies of a listing by mail, use the printable order form and include the information provided in the index. To order by phone call 405-522-5225.